Some machines are only able to read item numbers of a particular length (e.g. 7 characters). In order to resolve this problem LogiKal provides a tool by which you may alter or shorten too long profile numbers. The profile numbers are only changed for the machine link, as a matter of course the original numbers remain the same in LogiKal! Go to “CNC-Database” select a CNC and right click on it. Select the option “Profile Numbers” from the popup menu. All currently enterd substitution rules are listed here. 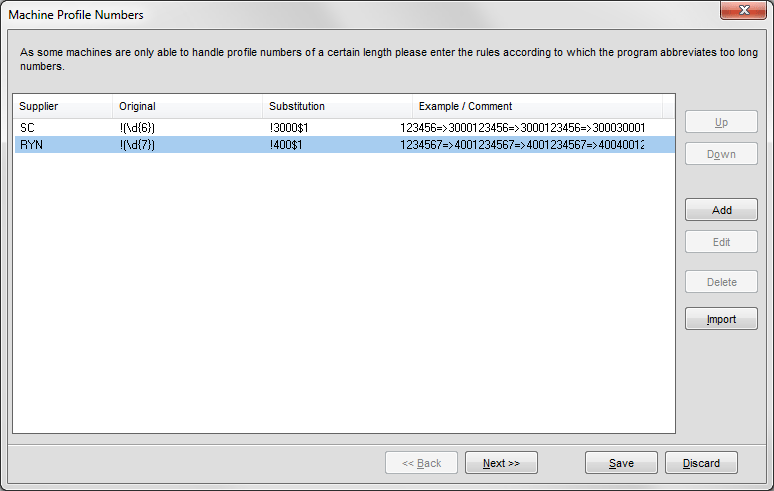 In order to set-up a new substitution rule click the button “Add”. First, you must select the supplier “Supplier” whose item numbers shall be replaced. 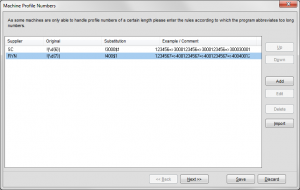 Input the search key of the original item number in the column “Original” and enter the substitution formula under the column “Substitution”. On the last page of this document you can find some examples. Important! Always enter an exclamation mark at the beginning of the formula! After having entered all substitution formulas click the button “Next”. A list of all altered item numbers and the applied formulas appears. Please bear in mind that the substitution rules have to be executed in the correct order. Select an entry of the list and move it by clicking the buttons “Up” or “Down”. If the sequence is wrong some formulas might not be applied. In this case the list entries will be marked red. Result: The underscore will be removed! Result: „1“ and „F“ will be replaced by „8“ and the underscore will be removed! Result: „PTS“ and „30“ will be replaced by „99“ and the underscore will be removed!